DESTINY BROUGHT THEM TOGETHER. NOW IT WILL TEAR THEM APART. Violet doesn't understand why she feels drawn to the Winterhaven School. She just knows it's the right place for her. When she discovers the school's secret, it all makes sense: Everyone at Winterhaven has psychic gifts., For the first time in her life, Violet doesn't have to hide her visions. She's always seen them as a curse, but now she can hone her ability and try to control it. But she's thrown completely off balance when she meets the most alluring - and most mysterious - boy in school. She's never connected with anyone the way she does with Aidan, and the intensity takes them both by surprise. But as their relationship deepens, she begins to have visions of Aidan's death - and sees that she's the one who's fated to kill him. Violet's never been able to prevent her visions from coming true. But this time, she'll do whatever it takes . . . even if it means sacrificing herself for the boy she loves. When her stepmother - the only parent she has left - is transferred to New York, Violet is given a choice: she can either live with her grandmother in Atlanta or attend the Winterhaven School in New York. 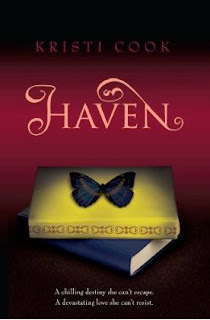 She doesn't want to be a burden on her grandmother, and she's drawn to Winterhaven. After her first day, though, she discovers that Winterhaven isn't just a boarding school - it's a haven for kids with paranormal abilities. For once, she will be able to live a normal life without everyone around her calling her a freak. Haven is a great book and a very fast and compelling read, but it is also incredibly derivative. There are definitely major themes from Twilight and Buffy, with a dash of Vampire Diaries tossed in to boot. If you can look past all of this to see the original compilation beneath it all, then you will enjoy the novel. Otherwise, it may not be for you.